Recovery from injury or medical procedures can take a long time, and being on long-term bed rest can make even seemingly simple activities more difficult. Things such as reading, enjoying a meal or a drink, or getting any work done on a computer or handling paperwork are all more challenging when put on bed rest. Thankfully, technology has evolved to make the experience of immobility or long-term bed rest easier. With the use of an over bed table, things that were difficult during bed rest become easy again. These over bed tables aren’t like other tables. They come with a framework on one side so that they can be easily slid over the top of the bed without needing to be hauled up and over as a normal table would. 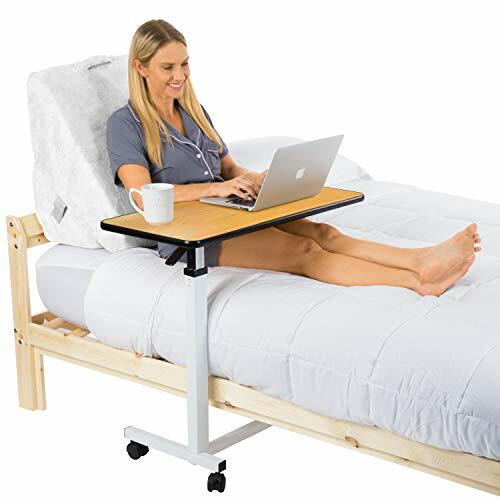 Whether it is for the hospital or the home, a rolling bed table is highly recommended by doctors and caretakers alike. Below are some of the most highly rated options for an overbed table on the market today. This stunning walnut wood-grained overbed table is a favorite among individuals. With a textured, laminated top and molded edges, it’s perfect for those who want to continue upgrading their home space with equipment that doesn’t look like hospital furnishing. This gorgeous walnut hospital overbed table looks like a desk that one might find in a library or home office. In addition to its beautiful top, it is finished off with chrome plated steel welded construction, making it a durable model for consistent usage. Users do not need to fear bending or breaking as it can support up to fifty pounds of weight. This bed also includes four wheels, two of which lock in place for stability. Not every bed is the same size, and sometimes it is better for a table to be higher up or lower and closer to an individual’s legs. For this reason, this overbed table adjusts easily between twenty-eight and forty inches with the use of an easy spring-loaded locking handle. Doctor Recommended – This product is the top selling hospital bedside table in hospitals and clinics. Durability – With a laminated top and flush mounted molded edge design, this model can withstand months or even years of wear and tear while still looking brand new. Stability – The simple framework and H frame base construction keep this hospital bed table from bending or breaking, and its two locking wheels mean that it stays in place so that individuals can enjoy full meals and drinks on their table without spills. Is This The Table For You? At an affordable cost, this is one of the most highly demanded overbed table units among individuals experiencing long-term bed rest or immobility. If you are looking for a table that does the job well and is a beautiful furnishing for the home, the Medical Adjustable Overbed Bedside Table with wheels might be the best option for you. IMPROVED DURABILITY & RELIABILITY - Heavy-gauge, CHROME-plated (not silver plated) welded tubular STEEL construction on a H-style base with 4" swivel casters. Provides long lasting stability and easy maneuverability. With a simple design, this overbed table is by far the most efficient on the market. Rather than shell out a ton of money on a hospital overbed table, spend less on an equally durable, equally functional unit that can do the same job. When it comes to adjustable features, this table is one of the best out there, with an adjustable height range spanning from twenty-eight inches to forty-five inches. It also maintains the industry standard for durability with a common H-style base and swivel casters. One of the benefits of this model is that it utilizes easy-to-use adjustment levers that make raising or lowering the table simple and maneuverable even from the bed position. The table can support forty pounds of weight and has an affordable price point, making it one of the best value overbed tables. Stability – The H-style frame base makes it easy to simply slide this table over the hospital bed. Height Range – This unit extends from 28” to 45”, which is one of the larger ranges of heights in bedside tables. Price: This model doesn’t compromise on stability, durability, or features, but it does make it much more affordable to enjoy the pleasures of an overbed table. 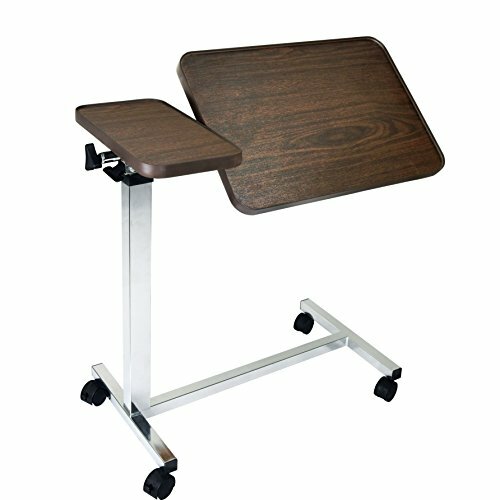 Anyone who doesn’t want to compromise on quality, but does need to shop on a budget would definitely be well suited to the Drive Medical Non Tilt Top Overbed Table. This simple design serves all the purposes other models do, without the exorbitant prices. Of all the products on the market at this time, this overbed table might be the one with the most exciting new features. It comes with all the same height adjustments and locking wheels, but this model also makes use of a tilting mechanism for increased usage. With the turn of a lever, this table can rotate at an angle for three hundred and sixty degrees. This rotation makes reading or using a laptop easier, and can allow for maximized mobility and functionality. One of the other fantastic factors of this model is that it is a two-part table. While one side rotates to hold up a notebook or tablet, a smaller section remains upright to hold your coffee, water, or snack upright and in place. You can have the best of both worlds with this fantastic new design. The unit also doesn’t compromise on other impressive factors. It supports up to fifty pounds of weight and adjusts within the impressive range of twenty-eight inches to forty-seven inches. It also utilizes a laminated wood grain top with a molded edge so that it not only functions well, but looks sophisticated. Customization Options – The height range of this product is impressive to start with, but it is also able to partially tilt 360 degrees while leaving a segment upright for more mobility. Appearance – This table looks gorgeous in a home or hospital room with its wood grain top. If you want to have the most independence and mobility while in bed, the Medical Deluxe Tiltable Overbed Bedside Table is one of the best options out there. Its tilting and height adjustment mechanisms are easy to operate and great for enjoying a number of activities or tasks in bed. This product exceeds the industry standards when it comes to how easy it is to operate and maintain. The Vive overbed table has made life easier for a number of bedridden individuals residing in hospitals and homes. By simply pushing the table up lightly, it can be adjusted, without need for levers or difficult switches. This product can support up to fifty pounds of materials. With corrosion-resistant surfaces of wood-grain laminate, this product maintains well over time and can be cleaned easily. It also includes a lip around the edges of the surface in order to keep important items like papers or drinks from spilling or slipping off the edge. Durability and Maintenance – This product stands up well to spills and stains, and prevents them as well. User-Friendly – This unit is incredibly easy to clean and to adjust. Simply lifting up the table or pushing up from the bottom lightly adjusts it and locks it into place, and for downward motion there is an easy-to-use lever. With so many options on the market, this overbed table is best for those who want an easy-to-maintain product that will last them a while. The Vive Overbed Table – Swivel Wheel Rolling Tray Table stands up to wear and tear. USE AT A BED, SOFA OR RECLINER: Providing a large tabletop surface, the overbed table is suitable for use at a bedside, a sofa, a recliner or with a wheelchair. A convenient solution for mealtimes, tabletop activities and laptops, the overbed table surface is easy to clean with standard household disinfectants. Perfect for those recovering from illness, injury or surgery. 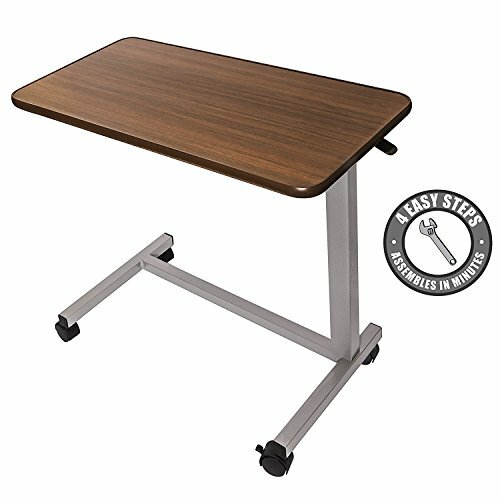 HEIGHT ADJUSTABLE: Featuring a one-touch adjustment lever, the overbed table quickly and easily adjusts between 28" to 39" in height for optimal positioning for any individual. Gently push the tabletop upward to raise the table and depress the adjustment lever to lower the tabletop to the perfect height. EASY TO MANEUVER: Using four swivel castors, the overbed table is easy to maneuver for use on the left or right side of the bed and to move out of the way when not needed. The column wheels also include locking tabs to stabilize the table while in use. DURABLE STEEL FRAME: Easy to assemble, the premium steel frame is corrosion-resistant and safely supports up to 50 pounds. The sturdy tabletop is constructed from a durable wood grain laminate with a slight lip around the perimeter to prevent items from sliding off. LIFETIME GUARANTEE: Lifetime guarantee so you can purchase now with confidence. With the rise in popularity of new and exciting designs, the tiltable overbed model has made an appearance twice on this list. Individuals flock to this walnut desktop for use in their homes or clinics. This product easily adjusts from twenty-eight to thirty-nine inches, but that’s not all. It also moves on an axis and tilts so that users can more easily utilize notebooks and writing utensils or have a better viewing of their tablet or electronic device. Customization Options – In addition to customizing the height of this model, users can also tilt the face of the table in order to function easier. Appearance – With lovely walnut wood-grain laminate, this model is a stunning addition to a hospital room or bedroom at home. For a beautiful furniture piece in addition to an adjustable, customizable tilt-table, try the Medical Tilt Top Adjustable Overbed Bedside Table with wheels. LONG LASTING AND SAFE - Powder coated heavy-gauge steel construction and swivel casters with locking mechanism. FLEXIBLE POSITIONS - Tilt-top allows infinite positions in either direction for added comfort and flexibity. DUAL TILT - Two-part overbed bedside table that tilts by adjusting the control knob. Ideal for beverages/food/glasses and small electronics. 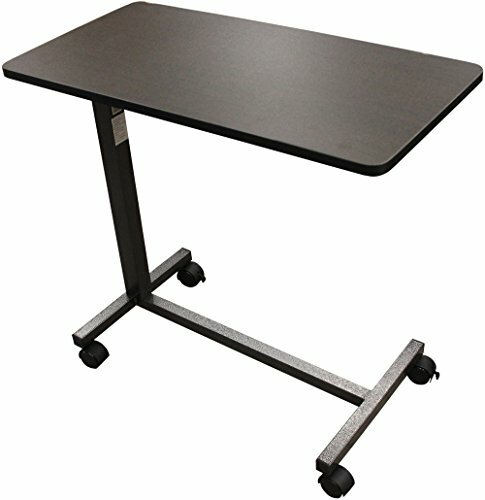 HEIGHT ADJUSTABLE -One-touch height adjustment feature - Table top can be raised with the slightest upward pressure for increased maneuverability. These units are so easy to maneuver that a patient can even move it themselves from the comfort of the bed, without external help from a nurse or loved one. This makes independent functioning just that much easier for individuals experiencing immobility or long-term bed rest.